Positive patient identification is the foundation of effective healthcare: the correct care delivered to the correct patient. Although consensus is undeniable, each individual staff member has different expectations for the right patient identification solution. 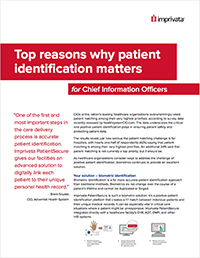 Learn the unique advantages for your discipline, as well as the overarching benefits for your healthcare organization.